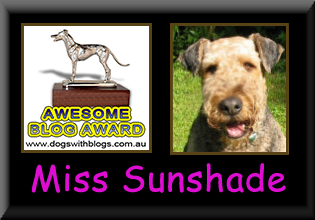 Life of Miss Sunshade - The Vancouver SuperDALE: I NEED some pointers!!! 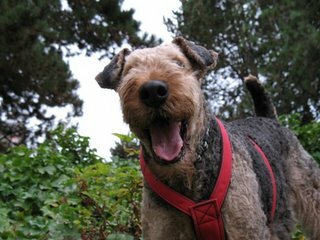 This afternoon, mum took me to her old school, the University of British Columbia to fulfill some of my "terrier needs". I had MANY chances, but NO real success....... WHAT AM I DOING WRONG?? 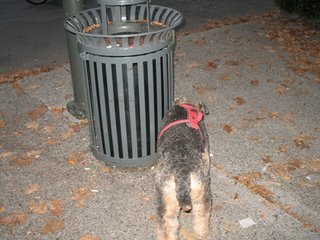 One squirrel in 7 years is not exactly a great track record for a terrier. So please, if you have useful tips, share with me!!! My track record for rats and mice is a lot better on the other hand......hehe! It's times like this that amaze mum the most because I've never ever tried to harm my Georgie or Mousie, even tho the terrier instinct is in me all along. after watching the videos, i think there is only 1 problem - the person who took the video make too much noise! don't you agree? otherwise you would have succeed at least once! or not! 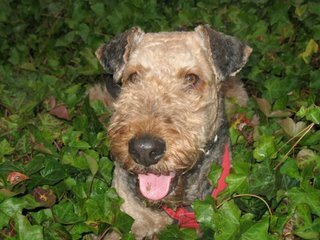 sunshade, don't be too kind to squirrels - like ivy said, squirrels are evil! Boo! Yes I KNOW where all the squirrels are, but they also know the sound of my tags and run away as soon as they hear my tags. So I had to get mum to fold my tags underneath my harness so they won't make that clashing noise. Are you sure the sound you heard from the video is from the camera person?? Cause *according to her*, she said she was very quiet...... maybe what you heard was the chuckling sound the squirrels were making?? 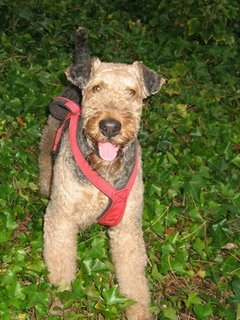 I am a terrible squirrel hunter tho, there is no denying..SIGH.. There are no squirrels near our house for me to hunt. I can only hunt roaches... sigh! Ms Sunshade, U R so cool. I like a sporty gal. I chase cats, any cats. MaMa always freaks out each time I go after one so there's never a chance to photographer nor record. Sunshade, the only two pieces of advice I can give you (and I do this, because I have caught squirrels, many chipmunks and sparrows) is to get as close as you can before you leap and tell Mommy not to laugh at you, as this will hurt your wonderful huntress ego. Oh, and last but not least...NEVER GIVE UP! Mom said that she can send you a link for some of those free snipes she was telling you about... she just needs your email address. You can post it on my blog or send mom an email: secrtrix@yahoo.com and you'll get a link to try auctionsniper for free! When I was in Petco yesterday with mom, I saw that they have these stretchy things that go over tags (like little rubber rings) to make them not clink and make noise... maybe some pressure to get mom to buy you some of those? 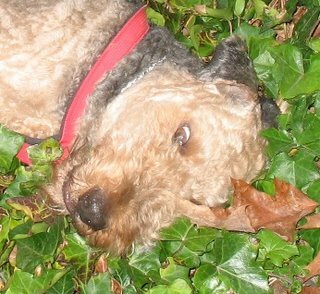 One good thing is an Airedale will kill the critter sooooooo quickly it never knows what happened, where as thoses cats play with it for a long time and the poor thing is terrified all that time. 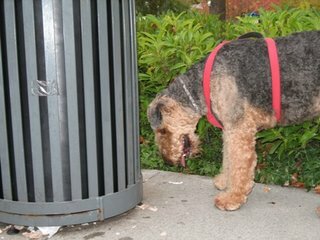 Yup nothing like an Airedale for being the best in everything. Oh and yes sunshade I intend to paint many more paintings of you, not to worry. Wow, your squirrels are dark! Ours are gray! Fast little buggers, aren't they?! I have never seen a rat but when we watched the video, Mama squealed as well! How come you never have to wear a leash? Mom and I are impressed with your mom's directing skills and your acting. You should make a real movie together about chasing squirrels and rats. I'd go watch it and bring my friends. I think it would be a hit!! Jay: are roaches yummy?? Mum is terrified of moths, so I always catch them for her and eat them. Extra protein ya know hehe! 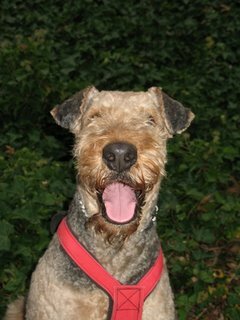 Jaffe: I LOVE to chase cats too, that's why if we are ever out for a neighbourhood stroll, I'm always leashed up...SIGH.. ROO: you are my IDOL!!! You have caught so many squirrels and chipmunks, I really need to learn from you. I really tried to get as close as I could to them ya know, but just never seem to be able to catch them. AND I KNOW, my mum is soooo mean to laugh at me!! Bogie: the rubber ring around the tags is a great idea. We saw something similar that's like a little pocket that you put the tags in, but my "Squirrel Patrol" tag is way too big. I'll have to go shopping!! OH, and thanks for the e-mail, I'll get mum right to it. Copper: we have a lot of dark squirrels, and some grey normal looking ones too. They sure are FAST!! Zach: Good question. I think this is what I get for being so stubborn and opinionated. 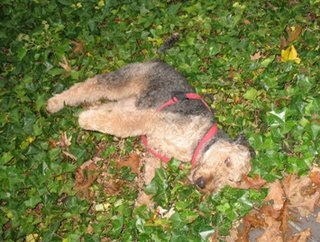 Mum doesn't like to walk me on-leash for reasons stated in my *almost* dog attack post. So she takes me to places that is safe for me to go off-leash. The university campus is very safe because only service vehicles are allowed in, and on weekends, there is rarely any service vehicles! T-man: Thanks for your compliment. I know, I should really make a movie, but don't you think you guys would get bored watching me miss time after time?? I need more practice first before making any movies!! Those are great pics, Sunshade. You are a SuperDale! wowie sunshade! wut you haf there is a target rich enviermint! i wish i had some pointers for you but you know i haf never cot an evil skwerrel either. i got a rabbit and a chipmunk once but those evil skwerrels just move too fast. i think we shud team up some time and see if we can outsmart those skwerrels together!